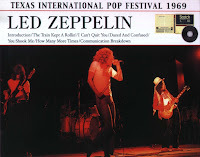 1969-08-31 Texas Motor Speedway, Dallas, TX "Texas Pop" (Genuine Masters) Disc 2 Listend to Disc 2, which is the 'Video Soundtrack Source' and looks to be a bit more complete, this source is 1:06:27 in length. Show starts with The Train Kept A Rollin' and I Can't Quit You Baby. Sound is clean and balanced. As with the show in Toronto, Plant mentions some trouble that happened th last time they were in Texas, but said they were glad to be back. Dazed and Confused comes up next, then You Shook Me. The show wraps up with an extended How Many More Times and then a quick Communication Breakdown. There is some static at the start of How Many More Times, but it seems to clear up after a while. This source had quite a bit of stereo separation, with Plant heavy in the left channel, and Page heavy in the right channel. Outstanding sound quality. Before 10/10/69 came out. This was the best SBD from 1969. I still use this show to "turn people on" to Led Zeppelin bootlegs. If they don't get it after this show, what's the point? My favourite zep boot of all time. "We've had about two hours sleep ... and we'd like to do one more for you"
Ha-Ha Fatman, I couldn't agree more except I mostly use the Fillmore West 4/27/69 soundboard as my "turn on" material.